This week’s challenge is monument. 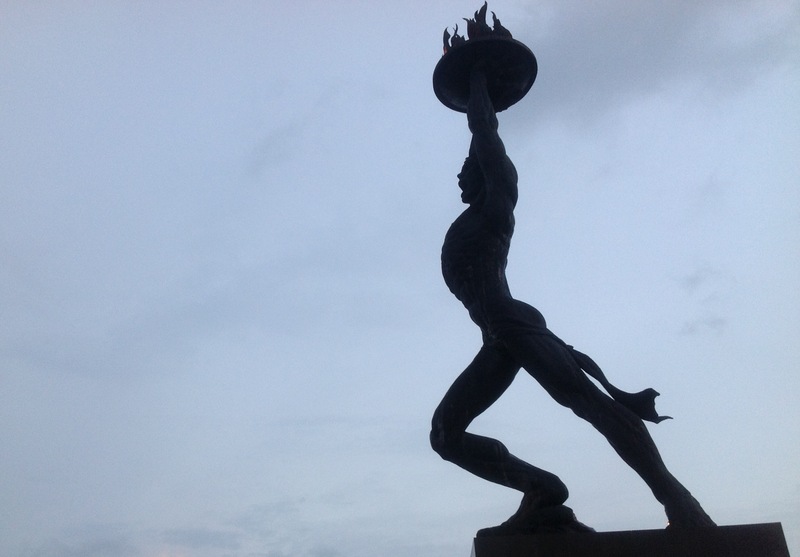 This immense statue was erected to symbolize the contribution of youthful courage in the development of the country. A bare-bodied young man is depicted holding a saucer containing an eternal flame up over his head. The flame represents the eternal spirit of youth, while the figure’s animated expression captures the enthusiasm of youth. The monument stands on a two-meter pedestal in the center of a pond surrounded by small flowering trees. It was created by a team of artists headed by M. Pamuncak and was donated by Pertamina, the state oil company. (Quoted from here). Picture was taken using iPhone and edited using Snapseed. Wishing a happiness ever after for Lulu and Adnan who will get married next Saturday. This week, the challenge is the Chinese Element of Earth. I took this picture in front of my office several days ago. After office hour, I grabbed my iPad and took some pics of the statue. 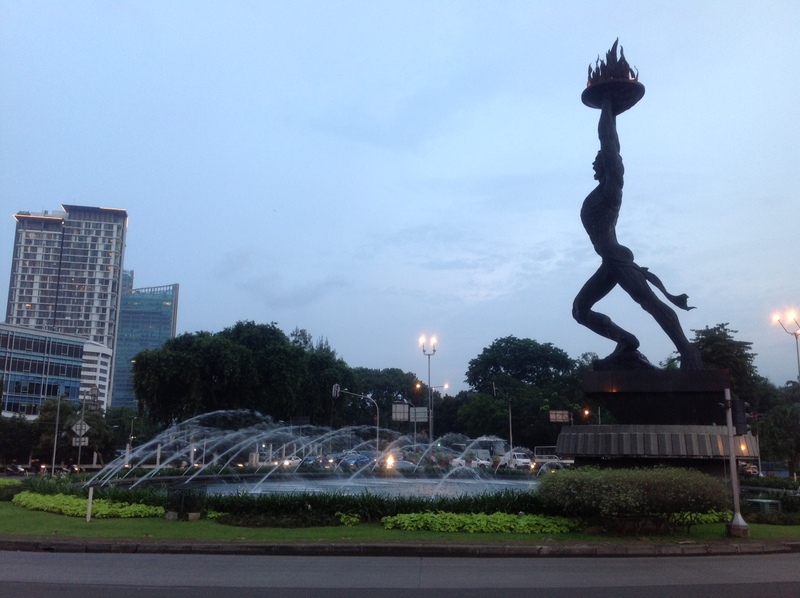 The statue is called Patung Pemuda Membangun (Young Man Develops (the country)). It was built to reward young male and female who contributes in the country development. 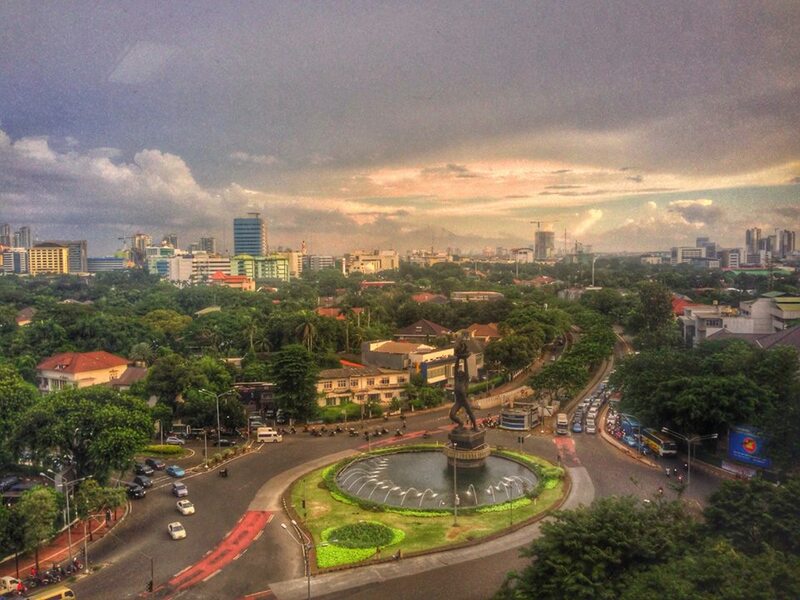 It holds fire shield that never die to describe the spirit of developing the country (hopefully) would never die. The statue was made from rock, thus match with the topic of the last challenge in the Chinese Element series. In the second picture I put the whole scenery of the statue with water fountain, electric poles, fire on top of the statue, and the trees behind. The pic shows all of the Chinese Elements. Metal/Autumn: Lightning, Magnetism, Electric, Rust, Gold, Silver, Steel, Iron, Platinum, Titanium, Copper, Bronze, Brass, Blood, Stars, Diamond, Energy. Here is a link to Metal. Water/Winter: Sea, Ice, Storms, Rain, Steam, Fluid, Sound, Mist, Acid, Salt, Time, Pressure, Moon, Mirror, Snow, Frost, Sugar. Here is a link to Water. Wood/Spring: Tree, Wind, Moisture, Air, Minerals, Ink, Mind, Rubber, Paper, Plants, Poison, Wax, Dissolve, Carbon, Clouds, Health, Space. Here is a link to Wood. Fire/Summer: Heat, Light, Lava, Radiation, Sparks, Plasma, Explosions, Burn, Blaze, Oil, Ash, Smoke, Glass, Napalm, Sun, Matter. Here is a link to Fire. memilih menu baru. Kalau mau traktir, bilang-bilang ya. Bubur Ayam ex depan ALFA, meruya. Sepanjang Jalan Karawang, hati-hati dikerubutin calo makanan (Hub.